This enchanting neoclassical villa in Santorini features 4 lavish air-conditioned suites interconnected in pairs, 2 Santorini Suites with private pool, a maisonette and an open-plan suite, all boasting exceptional facilities, luxury amenities and awe-inspiring views across the Caldera. Underfloor heating, Smart TV and Satellite Channels are just the beginning when it comes to luxury features. iPod Docking station, as well as iPod and iPads, are provided as well as high-speed WiFi. There's a wet bar, luxurious bath and body products, and the exceptional bedlinen is complemented by an extensive pillow menu.You'll want for nothing here with a 24-hour reception desk, the luxury of twice daily maid service and bell boy service, your wish is their command! The Aeolus suite is built across two different levels, the maisonette features a bedroom with a king-size bed on the top floor, bathroom with rain shower and glass walls. On the ground floor, you can relax in the comfortable sitting area and sofa bed while soaking up the views of the caldera through the windows. A separate sitting area boasts extensive views of the caldera and the volcanic islands. 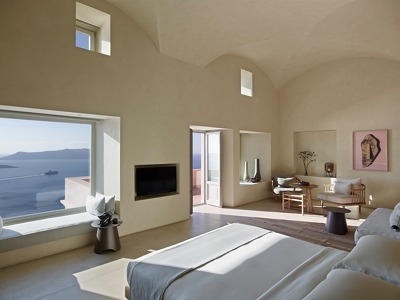 The Aqua Suite has unobstructed views of the caldera and the volcanic islets. Built in different levels, the spacious living room leads onto the bedroom. 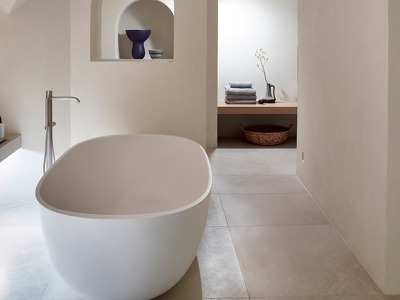 The open plan master bathroom has a large bath, private steam/ hammam room as well as the large dressing area. A private veranda features an outdoor Jacuzzi and sun beds with breathtaking views of the caldera and the volcanic islands. The Lava Suite has unobstructed views of the caldera and the volcanic islets. Built in different levels, the spacious living room leads onto the bedroom. The open plan master bathroom has a large bath, private steam/ hammam room as well as the large dressing area. A private veranda features an outdoor Jacuzzi and sun beds with breathtaking views of the caldera and the volcanic islands. Terra Suite features a modern living room with sofa beds and views of the caldera and the sea lead you to the large boudoir and separate bathroom with steam/ hammam. The bedroom has direct access to the private veranda with the Jacuzzi, sun beds and majestic views across the caldera, the Aegean sea and the volcanic islands. Demanding travellerswho like to find fault, good luck! Villa Bordeaux is unlike any other luxury hotel in Santorini. 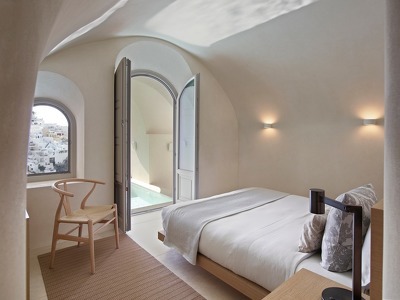 Space, serenity, and luxury pervade these 4 Santorini Luxury Suites which you'll find in the heart of Fira in the Cyclades islands, Greece. These stand-out suites in a neoclassical house are filled with charm, character and modern indulgent touches that will far exceed the expectations of even the most demanding globetrotter, some even have their own pool. The breathtaking volcanic views of the Caldera will melt the heart of everyone who stays. Santorini is one of the loveliest islands in the Cyclades. It's known worldwide for its magnificent sunsets, romantic setting and the breathtaking Caldera. The volcanic beaches, charming village life and simple good food attract visitors of all ages. Villa Bordeaux is in the vibrant capital of Fira, which enjoys a buzzing nightlife and is close to some of the best beaches in Santorini. Set 200 metres above sea level, this hip hideaway is the ideal base if you're looking to explore the scenic villages of Oia, Pyrgos and Kamari as well as enjoying the crystal clear waters of Perissa and Amoudi beaches. It's worth planning a tour to the volcano and visiting the thermal springs. If you have time take a boat trip to some of the nearby islands of the Cyclades. Villa Bordeaux only has 4 splendid suites and yet it features an amazing restaurant La Colline with majestic views of the sea and sunset. With over 30 years of experience in the culinary industry, Chef Jerome Coustillas has perfected the delicate balance between flavour and texture creating tantalizing French dishes that delight even the most delicate palate. His previous experience includes stints at Cap Eden Roc, The Palm d’ Or Restaurant of Hotel Martinez in Cannes and Private Chef to the Prince of Morocco. Flight duration from Athens to Santorini is about 30 minutes. During high season, Sky Express connects Santorini with other popular islands such as Crete, Rhodes and Mykonos. This enchanting neoclassical villa in Santorini features 4 lavish air-conditioned suites interconnected in pairs, 2 Santorini Suites with private pool, a maisonette and an open-plan suite, all boasting exceptional facilities, luxury amenities and awe-inspiring views across the Caldera. Underfloor heating, Smart TV and Satellite Channels are just the beginning when it comes to luxury features. iPod Docking station, as well as iPod and iPads, are provided as well as high-speed WiFi. There's a wet bar, luxurious bath and body products, and the exceptional bedlinen is complemented by an extensive pillow menu. You'll want for nothing here with a 24-hour reception desk, the luxury of twice daily maid service and bell boy service, your wish is their command! Perfect location. I have the most beautiful sunset view in Fira. The swimming pool is the perfect place to enjoy the sunset and sunlight. It is also a kids-friendly hotel. The service is well-attentive. I have a wonderful experience staying here. I wish I could come back again soon. Beautiful sea view, very good food, attentive service, built and decorated with great taste. Certainly the most beautiful terrace of Fira and the island for the sunset. Beautiful rooms. La Colline was a delight! Would say it's the best dining experience in Santorini! Amazing Venue. As typical for santorini, the view is so amazing, it is almost too overwhelming. The materials are well picked, it is stylish, calm and perfect for a get-away (if you are looking to spend some money). Enjoy!